It's August 1st which means a lot of academic planners are officially ready to be used! I'll admit that my excitement for this is a tad bit embarrassing but I'll embrace it nonetheless. The other day I wanted to write in my planner so badly that I looked up Furman's football schedule and wrote down the dates and times of all of the home football games just so that it could start to look like the color coded calendar that it is during the school year. You may be thinking it is normal to write down game days but at a small school like Furman where football isn't our main focus I can guarantee that my friends will laugh at this. So back to the point of this post… I love planners, for the most part y'all seem to love planners, and because of that I decided to share some of the best planner options I've found with y'all if by some chance you haven't had a chance to pick yours out! I purchased the planner I am using back in January and will be using it through this January when it runs out. I will without a doubt be purchasing another Day Designer as I adore the way they are laid out and how much room they provide me to write everything down. They are a bit expensive but I've linked an on-sale one as well as one from Target's collaboration with the company to ensure that no matter what price point you're shopping at they can be an option for you. I'll be sharing an updated agenda organization post with y'all in the coming month but for now if you want an idea of how to organize and color code your be sure to check out this post I did this past semester. Before the Day Designer I relied on Lilly Pulitzer Agendas for 4 years and loved those although if you have a lot to write down definitely get the jumbo size! Also I am not sure if any quote better embodies my love of organizing my agenda as this one. Hopefully I'm not the only one but I'll attempt to embrace it either way. So, for all of you writing in your agendas for the first time today I am excited for you! I'd love to know which of the planners above is your favorite or what agenda you use below! Oh, and on the topic of planning I'd love to know what sort of blog posts y'all would like to see in the coming months so that I can go ahead and start planning them out to make sure I have new content up for you as the school year gets busy. I couldn't stand yesterday because I wanted to start writing in my agenda so bad as well! I love that quote! It's my new motto, haha. I'm using the Lilly Pulitzer Jumbo agenda this year, but all the prints for the Day Designer are so pretty! There is nothing better than a new planner! 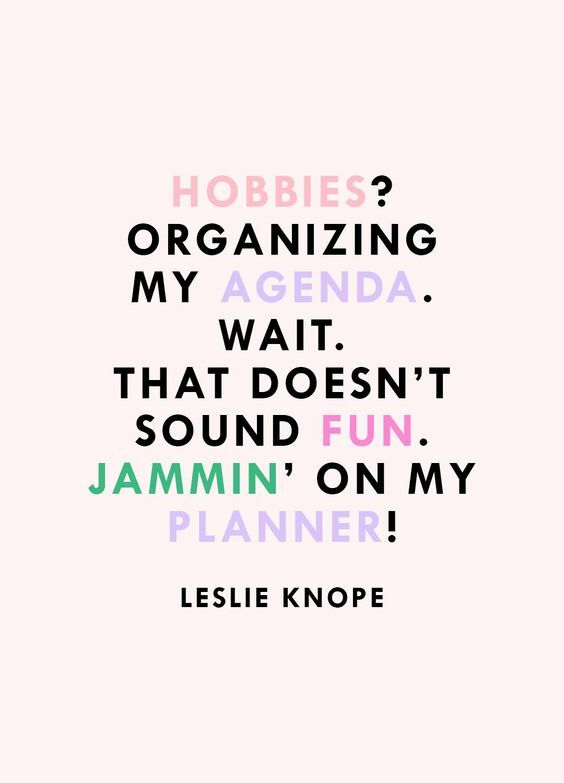 And that Leslie Knope quote is so ME! I would love to see posts about how you use your Day Designer this year. I have a simplified planner and it has a similar layout so I want to see how others organize theirs. Your agenda organization posts/videos are my favorite to watch! Excited for your one this year! I've been using the Emily Ley simplified planner this year and it's been great though I almost feel bad if my day doesn't look productive since there's so much white space. Could you do a back to school supplies haul post and/or video? I love agendas a well and will finally receive mine tomorrow. I've used different brands throughout the years mostly from target. This year I'm using a Sugar Paper for target. Would love another post on how you organise your planner this time around.